Each trial is heard by a judge and decided by a jury. There are 94 U.S. district courts in the United States. Every district court also includes a bankruptcy court. Each state (and Washington, D.C.) has at least one district court. So do four U.S. territories: Puerto Rico, Guam, the Virgin Islands, and the Northern Mariana Islands. The next-most powerful federal courts are the United States Courts of Appeals. They are also called "appellate courts." There are 13 Courts of Appeals. The 94 district courts are organized into 12 larger areas, called "circuits." Each Court of Appeals deals with appeals filed in their circuit. For example, the Districts of Massachusetts, New Hampshire, Maine, Rhode Island, and Puerto Rico are grouped together into the "First Circuit." If, for example, somebody wanted to appeal a decision made by the District Court of Massachusetts, they would write an appeal to the United States Court of Appeals for the First Circuit. The last choice for appealing a court decision is to file an appeal asking the United States Supreme Court to hear the case. Here is a map that shows which circuit each United States District Court is in. States that are the same color are in the same circuit. Each circuit has a number on it – for example, Texas, Louisiana, and Mississippi are in the 5th Circuit. The dotted lines on the map also show the areas which the District Courts cover. On the map, some states have no dotted lines in them. This means there is only one District Court in that state. For example, Alaska has only one District Court: the District Court of Alaska. This court covers the entire state of Alaska. Other states are divided into more than one district. The dotted lines on the map show where one district ends and another begins. For example, on the map, Washington is divided down the middle by a dotted line. Washington has two District Courts: the District Court for the Western District of Washington, and the District Court for the Eastern District of Washington. Here is a list of information about all of the United States District Courts. Just like with the map, districts that are in the same circuit are the same color. 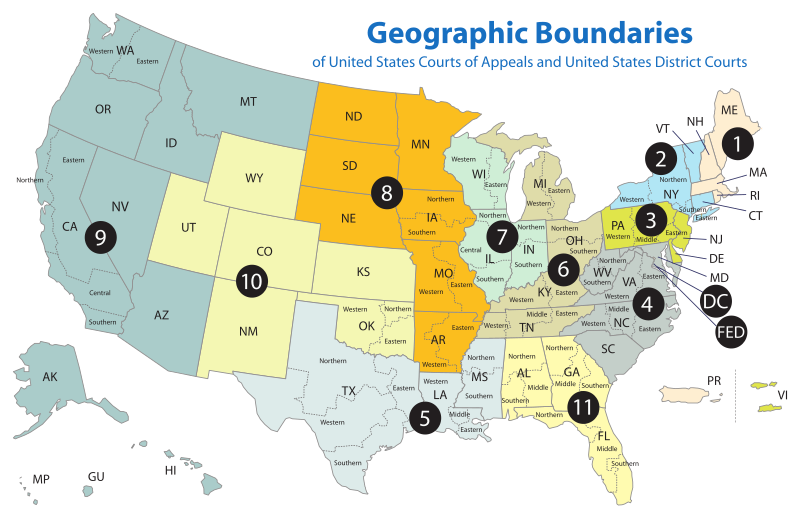 The colors are the same as the map (for example, districts in the 8th Circuit are orange on the map and on the list). To sort this table, click on the little triangle on the top row of the table, in the column you want to sort by. ↑ 1.0 1.1 1.2 "Comparing Federal and State Courts". United States Courts. Administrative Office of the United States Courts, Federal Judiciary. Retrieved March 29, 2016. ↑ 2.0 2.1 2.2 2.3 2.4 "Court Role and Structure". United States Courts. Administrative Office of the United States Courts, Federal Judiciary. Retrieved March 29, 2016. ↑ "U.S. District and Bankruptcy Courts". United States Courts. Administrative Office of the United States Courts, Federal Judiciary. Retrieved March 29, 2016. This page was last changed on 31 March 2016, at 16:38.